During the 70's and 80's, hundreds of split level homes were built all over the Tri-Cities area. 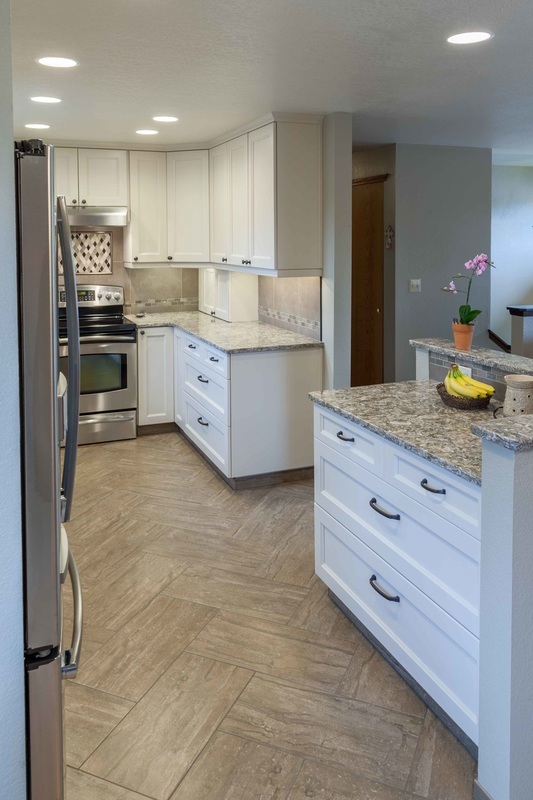 The very popular, split level floor plan, was recognized for delivering great value and livability at a very reasonable price. Depending on the size, some of these homes had great kitchens, but most had small kitchens, with a tiny in-kitchen table space, and a small dining room. Almost all of them were walled-off from the living & dining rooms, isolating the cook from the social interaction. We have remodeled a lot of split-level kitchens and used many different solutions. Keith & Shari's is a great example of the kinds of dramatic improvement possible. BEFORE: Keith & Shari wanted to open things up, while preserving the recently installed laminate floor outside the kitchen. 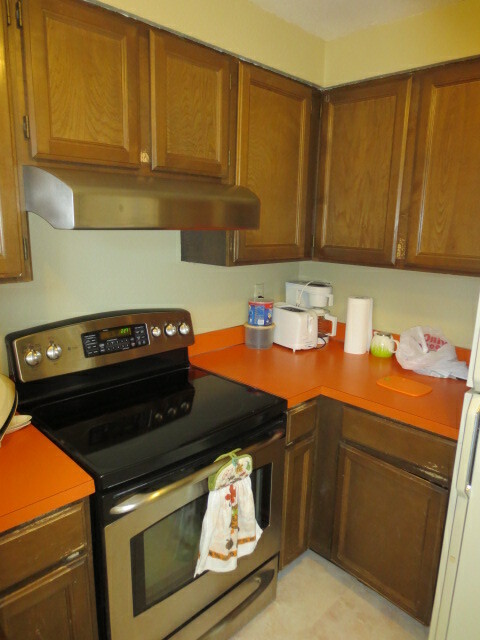 The kitchen was mostly original with the exception of the range and hood, which were recent upgrades. The layout worked fine for them, but capturing more storage and modernizing were priorities. AFTER: The first thing we did was to remove the top 1/2 of two of the walls to gain visual space. 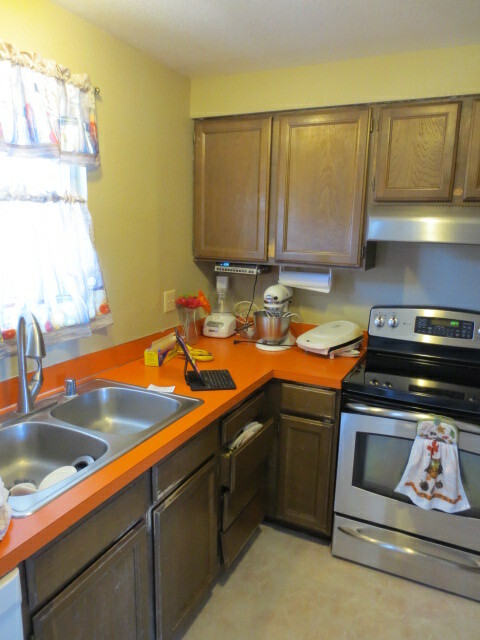 Next, we expanded the cabinetry to fill the unused table space in the kitchen. Since the space is now open, both the living and dining rooms are close enough for comfortable conversation. 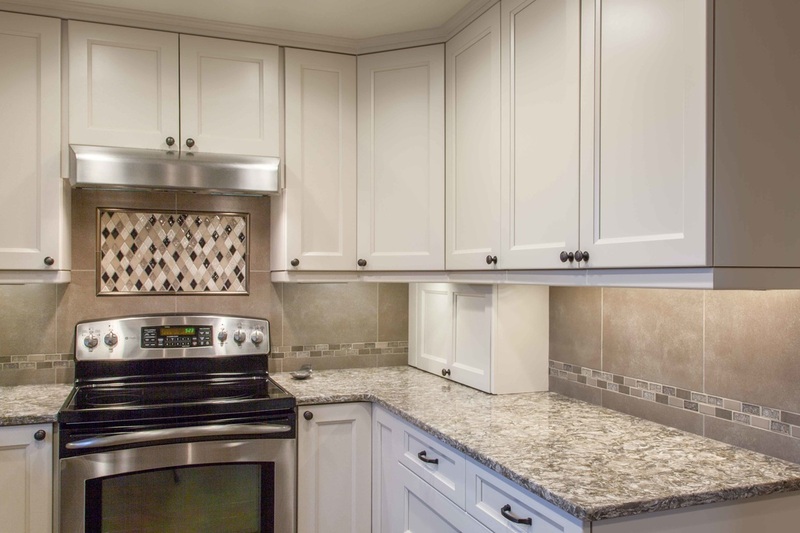 White painted cabinetry helped to further expand the visual size of the new space. 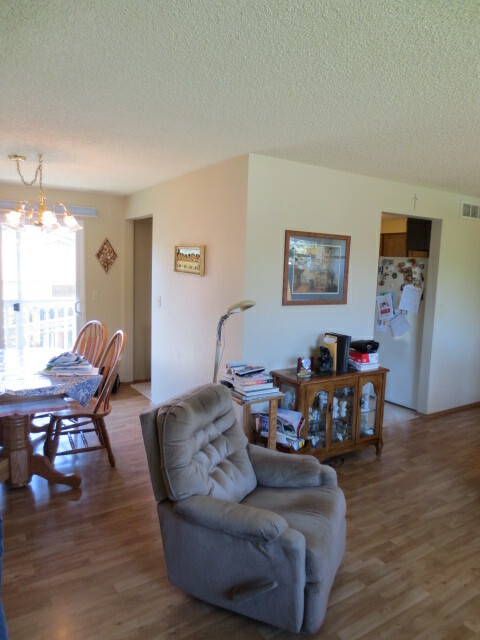 The herringbone layout of the tile floor avoided conflict with the laminate floor in the living room. Quartz countertops, a full height tile splash, LED under-cabinet lighting, and concealed angled plug strips add clean, bright, bullet-proof, and stylish elements to complete the space in a soft, elegant, & timeless manner. Stainless appliances, white cabinets, quartz countertops, and a porcelain tile floor in a 12 x 24 herringbone. A great combination! 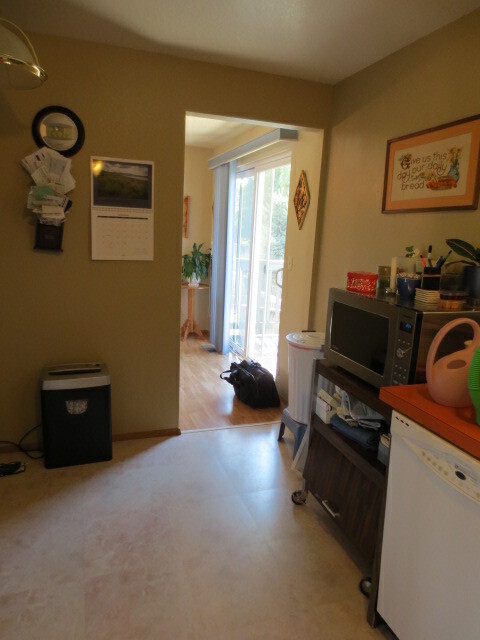 The former unusable table space (front right corner) became a huge set of drawers and additional counter space. The 12 x 24 herringbone tile on the floor adds a lot of interest. 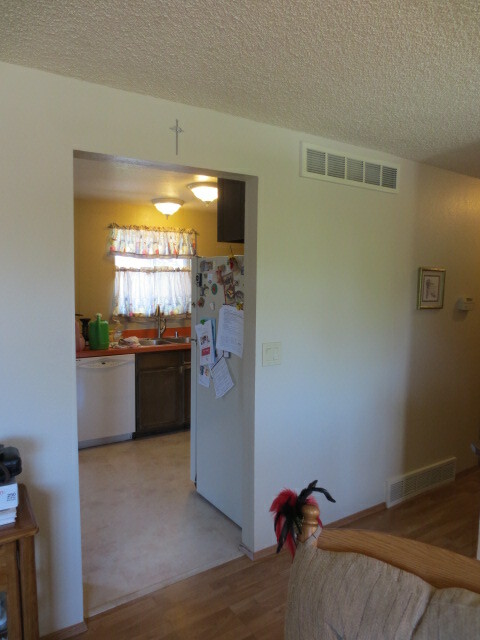 Removing the top 1/2 of the two walls effectively converted 3 rooms into one, while maintaining some physical separation. The liveability of this space just skyrocketed right off the charts. The appliance garage in the corner is not really as shallow as it looks. We recessed it 4" into the wall cavity to maximize the work space to the right of the range. 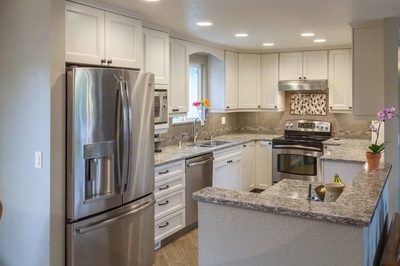 Notice the absence of visible electrical outlets in the backsplash. 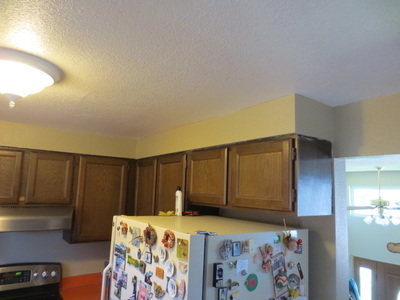 We used angled plug strips, just under the upper cabinets. 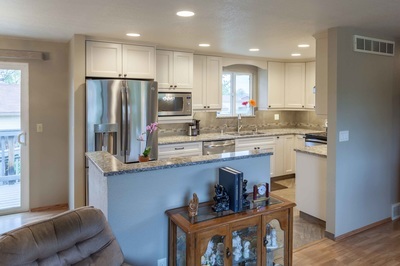 Client Comments: "We found Warren and his staff to be very professional in all aspects of our remodel project. Although we had been wishing for something better for our kitchen for a number of years, we didn't know where or how to start. Warren is a master at walking people like us through the process step by step, from design choices to styling, material and color choices. His entire staff aims for perfection and take extreme pride in their workmanship. Just ''good enough'' is not acceptable to them. Everything must be done to perfection. The project was completed in a timely manner and was right on budget. We recommend Kitchen & Bath ReStylers without reservation! " Thank You Shari & Keith!